This poster lays out advice and guidance developed by the Scientific Data team, along with colleagues from Nature Research and the University of Oxford, on how best to ensure visibility of non-public clinical datasets - when it is not possible to provide access to them. 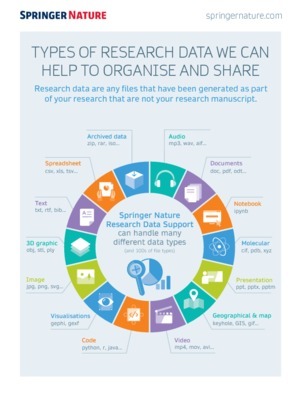 Drawing on Scientific Data's experience of dealing with these kind of data, the poster provides clear information on how to select a repository for hosting non-public clinical data, as well as describing potential workflows a journal can use to handle these types of data. Sharing of experimental clinical research data usually happens between individuals or research groups rather than via public repositories, in part due to the need to protect research participant privacy. This approach to data sharing makes it difficult to connect journal articles with their underlying datasets and is often insufficient for ensuring access to data in the long term. Voluntary data sharing services such as the Yale Open Data Access (YODA) and Clinical Study Data Request (CSDR) projects have increased accessibility to clinical datasets for secondary uses while protecting patient privacy and the legitimacy of secondary analyses but these resources are generally disconnected from journal articles—where researchers typically search for reliable information to inform future research. New scholarly journal and article types dedicated to increasing accessibility of research data have emerged in recent years and, in general, journals are developing stronger links with data repositories. There is a need for increased collaboration between journals, data repositories, researchers, funders, and voluntary data sharing services to increase the visibility and reliability of clinical research. Using the journal Scientific Data as a case study, we propose and show examples of changes to the format and peer-review process for journal articles to more robustly link them to data that are only available on request. We also propose additional features for data repositories to better accommodate non-public clinical datasets, including Data Use Agreements (DUAs).